Friday, March 31, marks the Transgender Day of Visibility, an annual celebration of the accomplishments and victories of transgender and gender-nonconforming people. Despite incremental progress for transgender people over the past few years—for example, some states and localities have passed trans-inclusive nondiscrimination protections and issued bulletins ensuring access to health insurance coverage—it is critical to recognize the work that remains to ensure transgender people’s rights and inclusion in the United States. 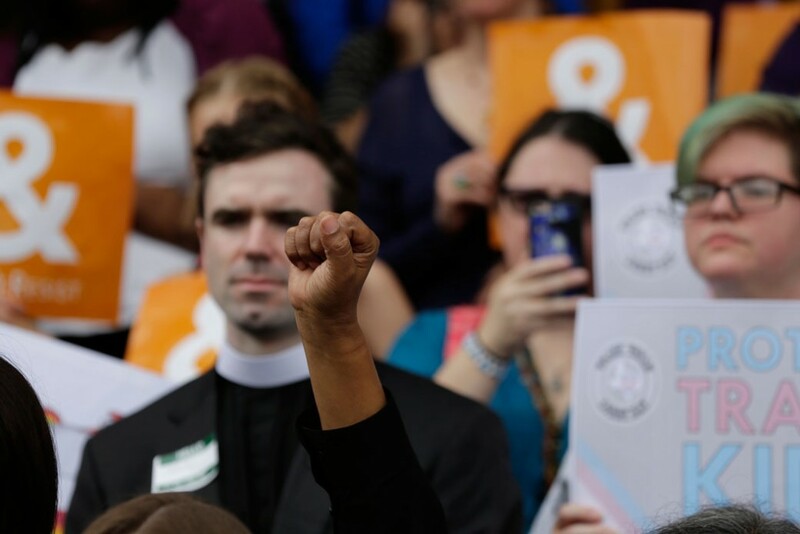 The Transgender Day of Visibility provides an opportune moment for communities of faith to contemplate how they are called to contribute to transgender justice. Meanwhile, the path to rights, inclusion, and legal protections for the transgender community has been made more difficult because of the Trump administration and other opponents at all levels of government. Over the past year, an onslaught of anti-LGBT legislation has been introduced—and, in some cases, passed—in state legislatures. Many of these bills specifically target transgender and gender-nonconforming people, such as North Carolina’s H.B. 2, a law that rescinded Charlotte and other cities’ LGBT nondiscrimination ordinances; banned future protections; and barred transgender people from using restrooms in accordance with their gender identity. Similar legislation is being debated in Texas and several other states. These actions, along with the anti-LGBT rhetoric of some of President Donald Trump’s cabinet members, signal that the transgender community will continue to experience unnecessary hardship and obstacles to equality from policymakers across the country. Anti-transgender legislation, its conservative supporters, and the religious lens from which they sometimes draw justification make it tempting to make a strong connection between being a person of faith and being anti-transgender. However, religious values compel people of faith to stand for transgender justice, and they are increasingly doing so. Transgender people in the United States face many barriers to health, safety, and inclusion in public life. The National Center for Transgender Equality’s “2015 U.S. Transgender Survey,” the largest survey of its kind exploring the experiences of transgender people in the United States, paints a comprehensive picture of the challenges facing transgender people, including economic hardship; discrimination, violence, and mistreatment; and negative physical and mental health effects. For example, 54 percent of transgender students reported being verbally harassed because people thought they were transgender, and 24 percent of students reported being physically attacked for the same reason. Furthermore, transgender people and their rights have been increasingly at the fore of news stories in 2017, including ongoing efforts in states to restrict access to the appropriate bathrooms, the NCAA promising to relocate all events through 2022 if North Carolina does not repeal H.B. 2, an alarming number of trans women of color murdered, and Gavin Grimm’s lawsuit being taken up by the Supreme Court and then taken off its calendar after the Trump administration rescinded guidance that affected the case. These statistics and the regular marginalization of transgender individuals make it clear that they are among the most vulnerable in American society, making protecting and supporting transgender people both within and outside houses of worship that much more important to people of faith. Many faith traditions’ guiding principles include a shared commitment to those who are vulnerable. For example, scriptures call upon people of faith to welcome the stranger or marginalized within society and care for those who are poor or otherwise in need. This commitment to help marginalized individuals extends to the transgender community, especially as their rights are often connected to the rights of low-income individuals, a group for which people of faith consistently advocate. Values of treating all humans with compassion, dignity, and respect further compel people of faith to stand up for the rights of transgender individuals. A culture trending toward inclusion is also put forth in sacred texts: The scriptures of both the Old and New Testaments point toward movement from rigid exclusion to greater inclusion of those living outside the margins of society. With these religious underpinnings, the moral imperative to stand for transgender justice is undeniable. People of faith who do not support transgender rights and inclusion are a vocal minority. Trends indicate that, though they may get headlines and make speeches in support of discriminatory legislation, their numbers are shrinking. In fact, only white evangelical Protestants have majority support for anti-transgender bathroom bills—every other major faith tradition in the United States shows majority support for transgender people using the bathroom appropriate for them. While certain segments of the white evangelical Protestant community are doubling down on excluding transgender people from their faith communities, even they show concern for the bullying and harassment that transgender people face. When thinking about religion and attitudes toward transgender people, it would be a mistake to ascribe discriminatory opinions to all people of faith. Polling shows that majorities of all major religious groups in the United States, including white evangelical Protestants, are in favor of nondiscrimination protections for LGBT people. 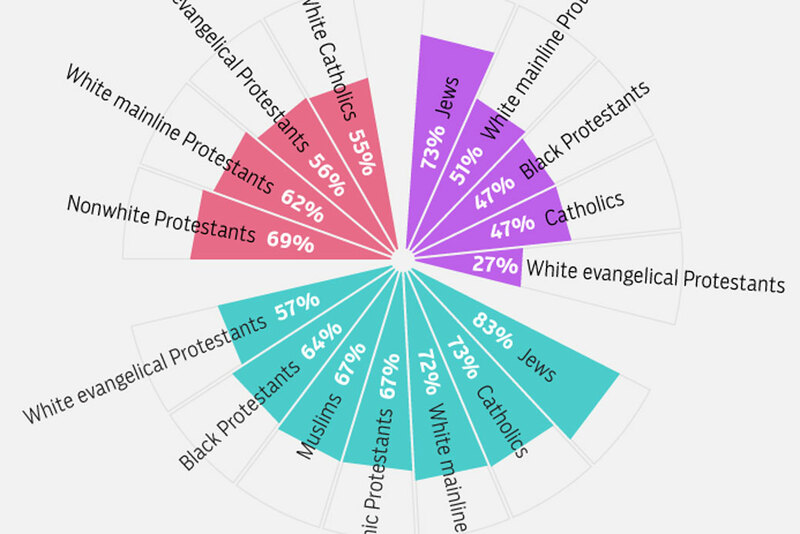 This support reaches almost three-quarters of the white mainline Protestant population and more than 80 percent of the Jewish population, and support is high even among Catholics, despite hostile views from the Catholic Church hierarchy. Even when it comes to access to public restrooms, majorities of many faith groups believe that transgender people should be allowed to use public restrooms that correspond to their gender identity. These views have translated into the creation of inclusive policies within denominations and congregations, as well as advocacy for public policies that treat transgender people with equality, respect, and dignity. Several denominations have taken official stances to address the inclusion of transgender people in their congregations and the transgender community’s rights in public spaces, including the Episcopal Church, the Union for Reform Judaism, the Unitarian Universalist Association, the United Church of Christ, and the Rabbinical Assembly—an association of conservative rabbis. Even more faith communities are supportive of transgender rights and inclusion in more informal ways or, at a minimum, do not have barriers to inclusion within their congregations. There are also numerous faith-based organizations dedicated to including LGBT people in in religious spaces, such as Many Voices: A Black Church Movement for Gay & Transgender Justice, Believe Out Loud, and Keshet. Similarly, events such as the National Weekend of Prayer for Transgender Justice are designed to engage in education, prayer, and action for transgender justice. Houses of worship have ordained transgender clergy, created gender-neutral restrooms, and put in place other systems to strive for spaces where everyone feels welcome. Permitting religiously based “anti-‘transgenderism’” to shape civil rights enforcement would both enshrine religious beliefs in the law and implicitly privilege some religious viewpoints … over others. …The First Amendment forbids both forms of religious favoritism. For these people of faith, the motivation to fight against transgender discrimination in public policy comes from their religious identities, not despite them. Communities of faith are not yet as universally inclusive as they should be pursuant to their own teachings about human dignity, love, and protection for the vulnerable. But there is hope in increasingly affirming denominations, and people of faith are becoming more and more vocal in support of transgender justice. Claire Markham is the Associate Director for the Faith and Progressive Policy Initiative at the Center for American Progress. Tracy Wolf is the Research Assistant for the Faith and Progressive Policy Initiative at the Center.